Carry a six pack in upcycled style with this holder that attaches to your frame. Who can forget the tragic six-pack accident of 2016? They lived to tell about it, but their favorite craft beer was all over Route 33. 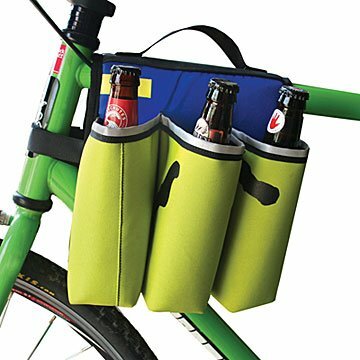 Carry those cold ones in safe, upcycled style with this bottle holder that attaches to your frame. Inspired by his high school job in a bike shop, Davidson Lewis has been incorporating bicycle inner tubes back into distinctive cycling designs ever since. Made from reclaimed tube material and upcycled tent fabric, the insulating carrier accommodates six bottles and includes a handle for toting your refreshments on foot. Due to the upcycled nature of this design, colors and patterns will vary. Handmade in Boulder, Colorado. Boulder-based Davidson Lewis' first high school job was working at a bike shop where he had an “ah-ha” moment: he noticed all the bicycle inner tubes and other durable materials that were being discarded. As a passionate cyclist and outdoorsman, he started to think how he could do something good with these materials. Through an environmentally friendly design project, he developed a line of gear made of bicycle and truck inner tubes, old seat belts, and scrap fabrics. Davidson's line has since expanded to offer all types of fun, functional bags and accessories. In addition to upcycling bicycle tubes, he uses reclaimed tent material, climbing ropes, wetsuits, and yoga mats. All these materials are diverted from landfills while equipping you for your ride or adventure. 9.5" H x 8.5" W x 6" D in. This gift was a hit! The colors were a bit loud for me...but fun! it's colorblocked with red, blue, green, etc. I was under the impression is was all green. My boss loves beer, but also just started riding his bike everywhere. He found it humorous, but will also legitimately use this product. My dad thought this was both hilarious and useful. Great gift! Gifted this to my husband for his birthday. He used it right way on his first bike trip to a friend's house. It attached easily, the bottles of beer made the trip safely, and made a great conversation piece upon arrival.